What do you think the liquid is? This entry was posted in Photography on April 16, 2010 by Grannymar. Some kind of synthetic colouring for sure! Grannymar, I just noticed that you post very early in the mornings your time! No wonder the posts are so riveting. I wish that I could do the same, post at six in the morning I mean! That picture makes my imagination run riot, particularly after your post on garden manure! Should I give them a hint? Maybe ask them in what else you would see those 5 colours together? Gaelikaa – See Elly’s comment below. Ramana – I set this post up at 5am this morning ready to go live at 6am and promptly went to sleep until 8am. Elly – Do you know where I was when I took the photo? Obviously it’s the new Stay-Young-Forever lotion from L’Oreal. Steph – You will be surprised! Nick – In a way it has been used as an aid to beauty. Motor oil and coolant?. . yes my tractor coolant is a brill shade of green! @Mum Sitting/lying on the kitchen floor just after you mopped it I would presume! Can I tell them yet? Or do I have to wait a bit longer? Should I give another hint? @nick – some would say that drinking these makes everyone look more beautiful…. Baino – You have me Laughing Out Loud! To answer Elly’s question: A rainbow—- so it has to be perfume for Gays. Rummy, I find your comment on this being something of a garden manure related item, interesting. I hope it smells better. They look like some sort of particularly revolting drink…. mind you the green one does look like some kind of engine oil or coolant. Maybe they’re versions of anti freeze….we used to make some weird ones when I worked for Dow…..
Fruit pastilles in liquid form…that’s the colour scheme i reckon. Salad – do you know Mayo? 😉 I did hear the word rainbow mentioned when I first saw the containers being prepared. The containers are all clear glass. Magpie – You are warm…. but remember you are going two different directions in the comments above. 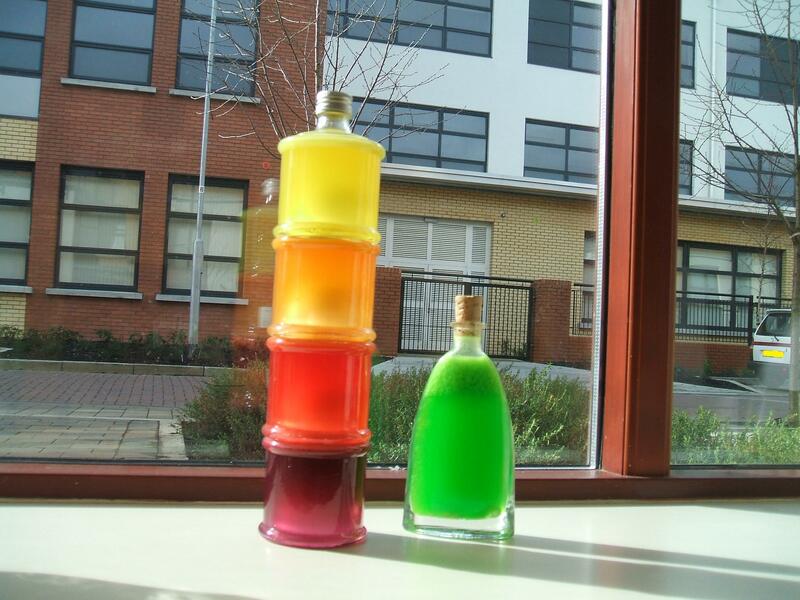 Personally I’m surprised that there isn’t a collection of washing up liquid sold in bottles like that to stack on the windowsill, but I suspect Elly is hinting at “tasting the rainbow”. Have you been “cooking” with interesting triple distilled liquids and fruit flavoured sweets? (again?)? I only know “mayo” on sandwiches. Is there another form of “mayo”? Back to your colors, it is “hairspray” in alkaloidial form. Start with yellow an by the time you get down to the purple, then your hair looks like “crap” and now we are back to Rummy’s comment. Salad, you are incredible you are. Haven’t you come across the one and only Mayo on GM’s comment box yet? A pity. He is a treat! Oooohh Magpie, you may be closer than you think…..
Grannymar, that stuff looks like something I would use on my underarms. Do you have any idea whether it stains? Will – Are you asking Elly? I find it hard to keep up with all she does these days. Judy – I think you mean an apéritif. They would certainly leave you with a glow! Millie – I know it won’t sting, but I am not sure about stains! I guess it’s time to let the cat out of the bag. A very simple recipe, you simply take about 25-30 skittles of a single colour and add to vodka. Leave it to sit for 2-3 days and they dissolve and flavour the vodka. Drink neat (in small quantities). Wow – and I thought limoncello was nice!!! I must try this!! Skittle juice! I love it! No Starvation or Extreme Exercise. Lose 10% Of Fat In 30 Days! Would anyone like to know how to make Cherry brandy? Maynard – It gives a whole new meaning to the game. Magpie – I guess by now you know what Skittles are. I would love to know how you make Cherry brandy!